Introduced as "MGM" to the Western World and taken over by Trumpeter after a few years. 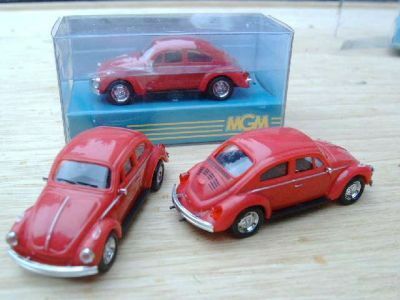 This take-over seems to have happened rather sudden, the three pictures below show (left to right): bottom of a case where the MGM logo has been replaced with a Trumpeter logo that looks as if it is branded into the plastic / bottom of another case where the MGM logo has been removed / the bottomplate of a CLK-DTM where the MGM logo has been removed. 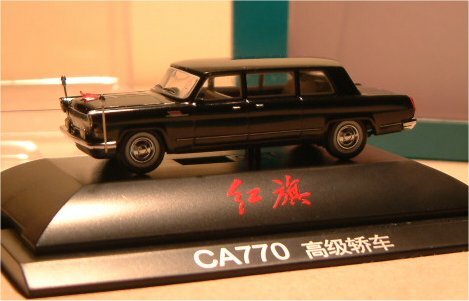 This range is supposedly out of production, but the Hong Qi / Red Flag 770 limousine and an all new model of the Hong Qi Century Star convertible appeared in the Brekina program in 2006. In 2007 Brekina will be releasing several versions of the Porsche 956. 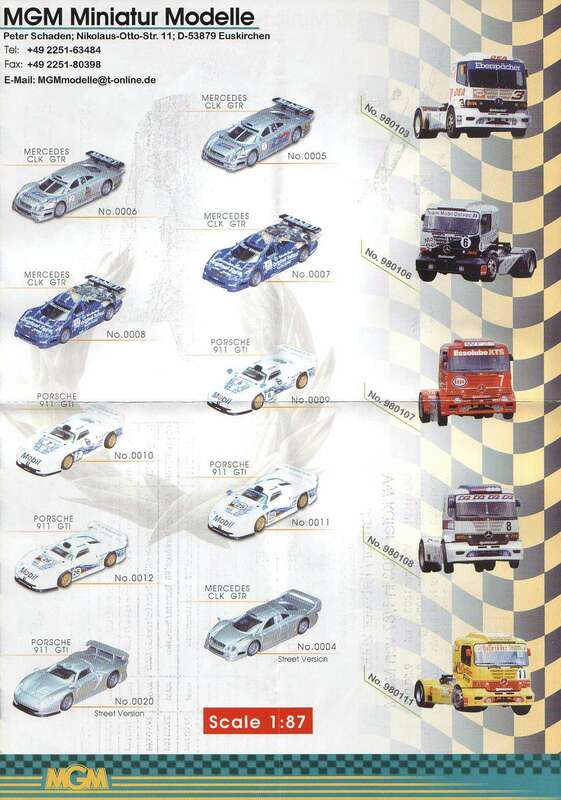 0001 Mercedes CLK GTR FIA GT 1997 Nannini/Tiemann Nr. 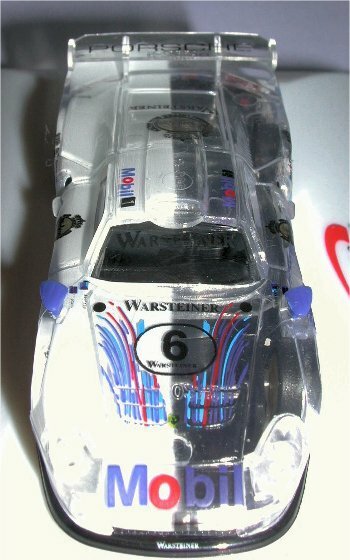 10 "D2"
0002 Mercedes CLK GTR FIA GT 1997 Schneider/Wurz Nr. 11 "D2"
2007 BMW M1 Procar C. Regazzoni "Kreistelefonbuch"
2009 BMW M1 Procar M. Andretti "BMW Motorsport"
3001-1 Mercedes CLK GTR LM transparent Nr. 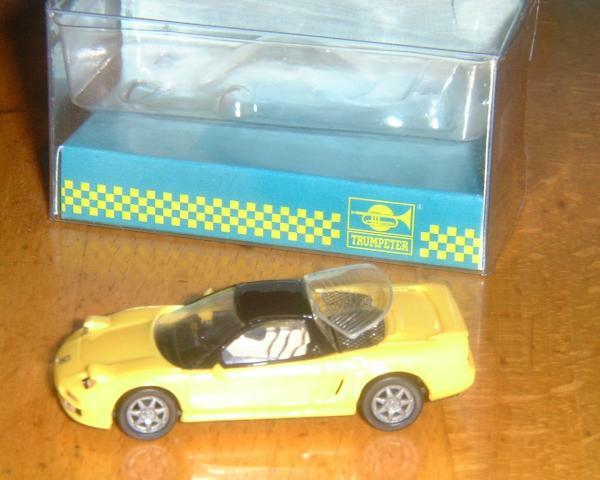 35, Motor Show Essen 1999 promotional - limited to 250 pcs. 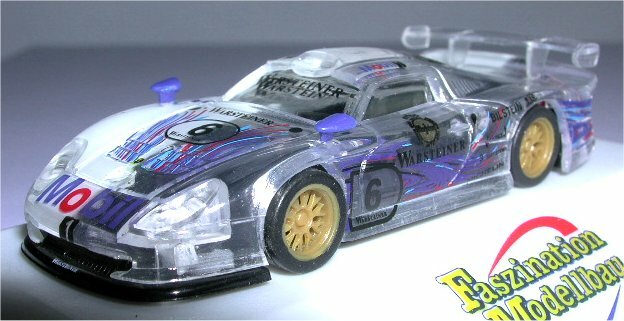 3002-1 Mercedes CLK GTR LM transparent Nr. 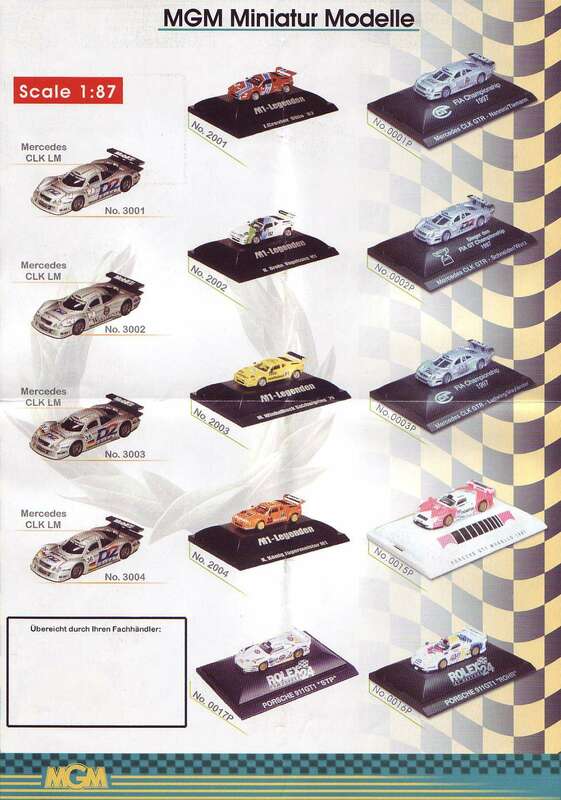 36, Motor Show Essen 1999 promotional - limited to 250 pcs. 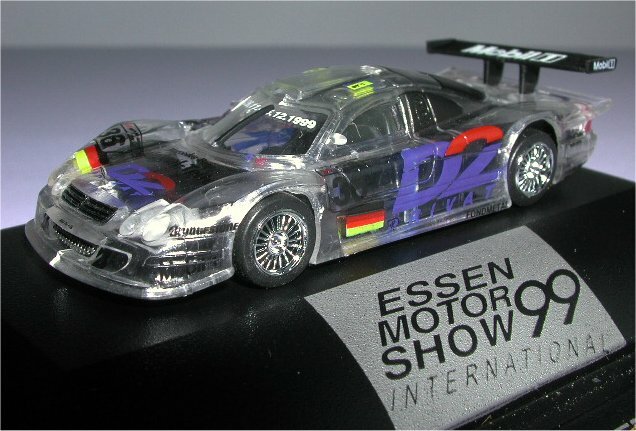 3024P Mercedes CLK Coupé DTM 2000 M. Tiemann Nr. 16 "Original Teile"
3025P Mercedes CLK Coupé DTM 2000 P. Dumbreck Nr. 19 "Original Teile"
3026P Mercedes CLK Coupé DTM 2000 P. Lamy Nr. 14 "Team Rosberg"
3027P Mercedes CLK Coupé DTM 2000 D. Turner Nr. 15 "Team Rosberg"
4021p Porsche 956 Le Mans 1982 Ickx/Bell Nr. 1 "Rothmans"
4023p Porsche 956 Le Mans 1982 Nenn/Ballot-Lena/Schlesser Nr. 47 "BP"
4024p Porsche 956 Le Mans 1982 Andretti/Andretti/Alliot Nr. 21 "Kenwood"
4025p Porsche 956 Le Mans 1983 Plankenhorn/Lässig Nr. 18 "Boss"
4027p Porsche 956 Le Mans 1983 Schuppan/Holbert/Haywood Nr. 3 "Rothmans"
4028p Porsche 956 Le Mans 1983 Edward/Keegan/Fitzpatrick Nr. 16 "Skoal Bandit"
? Porsche 956 streetversion announced, not confirmed if it was ever made.
? 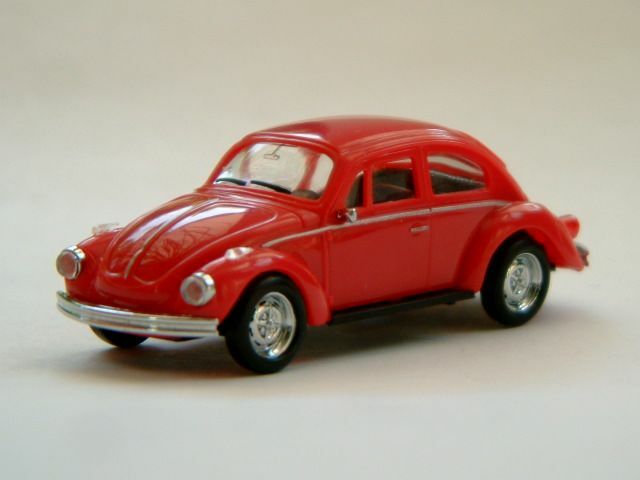 Red Flag CA770 convertible announced, not confirmed if it was ever made. 10021 Chromed rims for two cars "CLK GTR Racing"
10022 Chromed rims for two cars "CLK GTR Street"